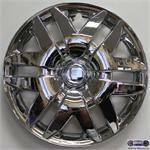 61124a, HUBCAP COPY, 16" 04-08 TOYOTA SIENNA. 6 V SPOKES. CHROME. SET $76.90.OME. 61124a, HUBCAP COPY, 16" 04-08 TOYOTA SIENNA. 6 V SPOKES. CHROME. SET $76.90.